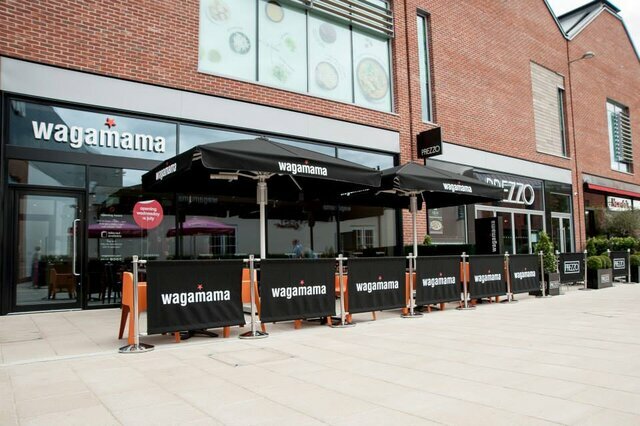 Wagamama Japanese Restaurant & Noodle Bar Now Open In Hereford. Why would you want to eat any later? LIKE a phoenix from the ashes, River Island is returning to Hereford as part of the Old Market after, in 2010, its High Town store closed following damage sustained during a major city centre blaze. The new store will be located on Auctioneers Way and will â€œhelp Hereford stay on trendâ€, said a statement from the development's management company. The Old Marketâ€™s centre manager, Scott Lahive, said: â€œWe canâ€™t wait to welcome River Island. Fashion store Joules will also be opening its doors this Thursday at the Old Market. The original River Island was damaged by the High Town fire that ripped through neighbouring store The Card Factory in October 2010. Since then a long-running dispute over insurance payments had seen repair work stall. However Herefordshire Council issued a statement last June indicating that the situation was resolved, despite little sign of improvement since on site. The old site, still derelict in High Town, could always be used as a back drop for those World War II films reliving the Normandy landings. Must bring back a lot of old memories for those Herefordshire soldiers who fought out there. Shame the previous River Island premises aren't "helping Hereford stay on trend". Still a complete mess. I have no faith in the statement from Herefordshire Council, reassuring us that the situation is "resolved." As with many things in life, actions speak louder than words. And to date, there has been nothing. Just to refresh memories closer to home. Hereford Heckler also had something to say. I've said before that it is well within the Council's remit to rectify this situation - they have the legal obligation to protect listed buildings. They have the right to either implement the work and recharge it to the owners or to compulsorily purchase the site, do the work and then sell on when complete - another council has done just this and made a profit to put back into the coffers. That our council won't do either, indeed consider the matter 'resolved' is a disgrace and merely reinforces their contempt for High Town and the people of Hereford. They dance only to the tune of the money men. They will have to account for this next May. Please keep on topic guy's there are separate topics on the OLM in general HERE or HERE this topic is about Wagamama. Did anybody else know that according to wiki.answers, the word Wagamama translates as "let me be selfish." Isn't that an interesting factoid!! So we are fortunate to have a whole Cabinet full of wagamamas here in Hereford! ragwert, please keep to the topic in hand, in this case this topic is about Wagamama. Feel free to create a new topic. In this one thread alone, me, Biomech, TWG, Megilleland and Ragwert have all been told off!! That must be a new Voice record! I apologise in advance, Colin for this random comment!! Colin, I will keep it to the topic in hand - not like some of the troublesome Posters like Dippy you know who ! Dono yo no shitsurei, Ubique!! Watashi no yoi namae o chusho o chuzo!!! Dippy , thank you for your very simple explanation , not sure if it's for me and Mrs U . My Japanese is a little rusty, Ubique.....but at least I kept on topic with that reply! That's quite an achievement for me, as I struggle with remaining focussed for any length of time......so many random thoughts, so little time to process them...!!! Dippy , how do we know that you kept on topic with your apparent rusty Japanese . Bet that Colin is getting your words of wisdom translated as we type. Still asking if anybody has tried this restaurant - that's wagamama of course . We ate there last week and had a really good meal. It was busy too which was good to see. Thanks Mick , will try it soon - that's after a recce to look at the Menu . I spent just over 2 years in Nagasaki working for Mitsubishi Heavy Industries at their ship yard advising on placement of hotel equipment when they were building 3 cruise liners. Wagamama's is as authentic as you can get in Britain in my opinion. In Japan, the chefs training is from 4 to 8 years, but I doubt that happens here. My wife and I had a wonderful meal, a bit pricey but you do get what you pay for. Service was excellent, with the traditional Japanese way of serving individuals and not the whole table at the same time. Slim , thank you for taking the time to do a "Review" . If you enjoyed the meal etc. after your experiences in Japan it's a very positive sign. Hopefully you can translate what Dippy posted a couple of posts ago ........ Do I need to take the matter further ? You will note that Dippy received a ticking off from the Adminstrater for drifting off post so he / she is a law unto themself it appears . No idea what he said. Knew please, thank you, beer, hello, goodbye.